The fun doesn’t have to stop at just the trampoline. Once you’ve purchased a trampoline for your family, the best part is customizing it. Trampolines are for more than mere jumping. 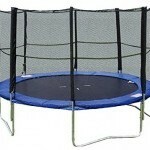 There’s tons of cool games and accessories that make a trampoline a little more exciting – for both kids and adults. 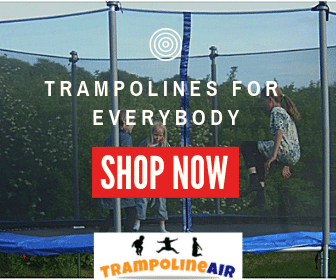 A trampoline is merely the starting point for something that’s even more fun, and it’s waiting for the imaginations of your children to run wild. It can be a volleyball court, a basketball court, a snowboarding simulator, or even a space for creative children to craft their own unique works for art. You need a ladder for taller trampolines. They make it easy for jumpers to get on and off the jump pad. Most trampoline frames are durable and weather coated, so you’ll want a ladder that meets the same standard of quality. This is a general fit ladder that will work with most trampolines, and it’s guaranteed to last just as long as the frame of your trampoline. The wide, textured steps make it easy to climb and prevent slipping. Install the ladder right in front of the zippered part of the safety enclosure, and you’re ready to go. 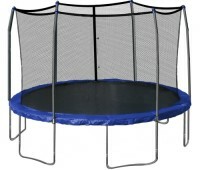 Games that involve all soft components are safe to use on the trampoline, and great for smaller children. This game comes with both a ball toss and a target with a bullseye. Both of them attach to a trampoline safety enclosure, and they come with soft beanbags for tossing. 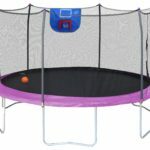 These games are especially fun on larger trampolines, where children can stand from far distances to make the game more challenging. This is more than just a fun way to pass the time – it helps children develop coordination skills. Once they get familiar with the games, they can play them while jumping high in order to up the difficulty level. 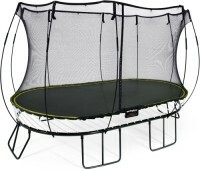 Basketball games are among the most popular trampoline accessories. This particular basketball hoop mounts to the enclosure poles, and comes with a mini ball. You can select from a wide variety of colors and themes, personalizing this toy to your child’s interest. A mini basketball is easier to maneuver on a trampoline, and great for the hands of small children to toss back and forth. Kids get to jump as they bounce, making them feel like real basketball stars. Ramp slides are an alternative to traditional ladders. To get onto the trampoline, children can climb it like a ramp. To get off, they can slide down. When it’s not in use, this slide is designed to fold up underneath the trampoline for storage. 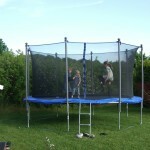 It comes with a universal mount that fits trampolines of all shapes and sizes, so compatibility isn’t a concern. Small children will love the fun of sliding down to the grass when it’s time to stop jumping. You need to take your shoes off before you jump on the trampoline. The best way to keep them from getting muddy and prevent curious ants from crawling inside of them is by storing them in a mesh net like this one, where they’re safe above the ground. This net also serves another purpose – it can hold bottles of water and snacks for jumpers who want to take a break and stay hydrated. You can’t jump with a drink without spilling it, but you can always store your bottle in this hanging storage net. 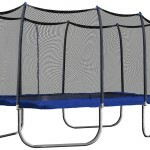 Purchasing multiple nets is a great idea, as they can also be used to store trampoline toys and accessories while they’re not in use, making it easy for children to swap out one activity for another. Volleyball nets are easy to install to safety enclosure poles. This particular net can extend over 19 feet, making it fit virtually any trampoline simply by rolling it to the desired length. It comes with all necessary hardware for installation, and goes up in minutes. It’s easy to unroll when not in use, so children can enjoy the full space of the jump pad without having to crawl underneath the net. 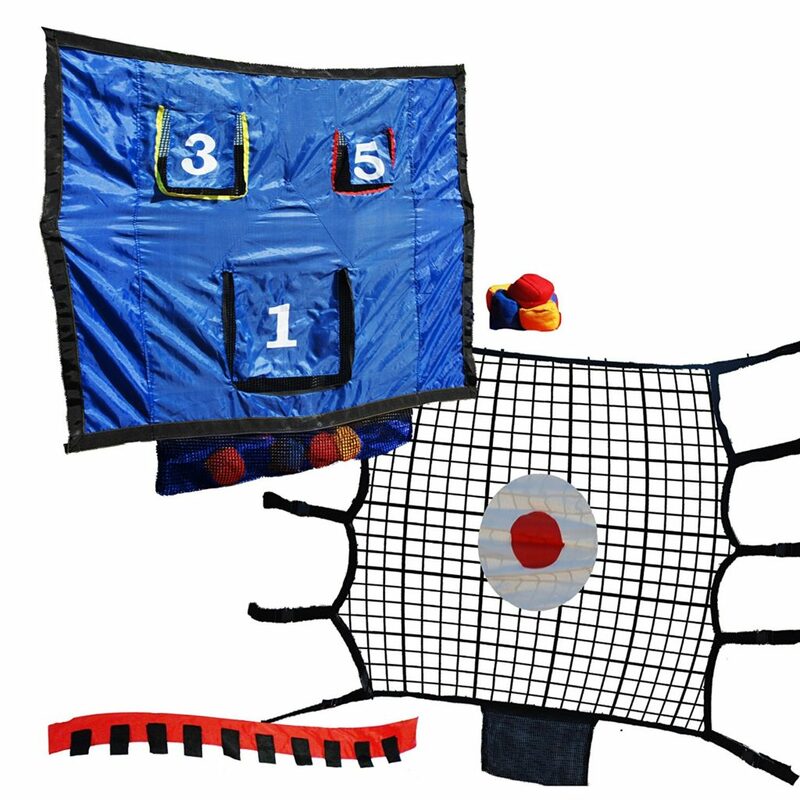 Children can use this net with a volleyball, or even with badminton equipment. This is a great choice for families with multiple children who enjoy competing against each other at games. 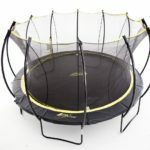 This is a unique trampoline toy that serves a few purposes. It’s great for shielding children from the sun on especially hot days, but the real fun comes from using the tent to camp. Trampolines are great spots for backyard campouts. The jump pad is a lot more comfortable than resting on the ground, keeping your children elevated and away from bugs. They’ll feel like they’re on a fun family camping trip, and they’ll never have to leave the back yard. With a little imagination and a few flashlights, this tent helps transform your trampoline into a whole new experience. All you need to do is make some smores and tell some campfire stories. This kit encourages your kids to use their imaginations in order to create games with the included supplies. There’s a set of colored chalk than can be used for playing games like tic tac toe directly on the jump pad, or even decorating it with art. There are three soft, low impact squishy colored balls, and four colored bungee cords. Your kids can invent their own games or consult the included handbook, which includes 20 game ideas involving the things that come in the kit. Encourage them to experiment, or allow them to use some of the suggested ideas. A Bounceboard is used to duplicate other sports that would usually be performed in more dangerous conditions within the safety of your trampoline. Things like skiing, surfing, snowboarding, and skateboarding are a little difficult for learners, and being able to acquire the skill on the rebounding surface of the trampoline can set kits and teens up for success. The Bounceboard comes with two openings for feet, which include Velcro safety straps for a snug fit. The bottom is slip resistant, and the body is made of a flexible polyethylene for safety. 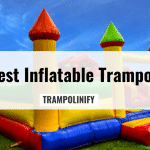 Young children will love having some bounce house balls on their trampoline. 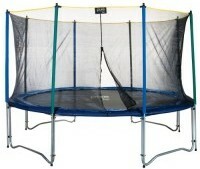 They’re especially great for small diameter trampolines that are typically purchased for toddlers. Empty the balls onto the jump pad, and the enclosure net will keep them from falling off. 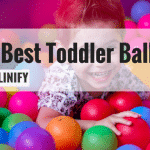 As children jump, the colorful balls will bounce with them. They can even be used to safely play toss, and they’re made of a soft plastic. Best of all, they’re crush proof. You won’t have to worry about the little ones flattening or puncturing them during play. They come with a reusable zippered storage bag, and they’re fun to toss back into the bag when the children are done playing. The texture of trampoline jump pads makes them an excellent surface for sidewalk chalk. This means drawing, writing, and even playing games are all a go. This is a bulk chalk pack that comes with a total of 48 different colors, so the budding artist in any child will have a chance to emerge. These chalks are washable, so it’s easy to clean the jump pad with a little soap and water so your child can start a new masterpiece every day. By purchasing accessories like stencils or chalk sprayers, you can take the artistic concept even further. 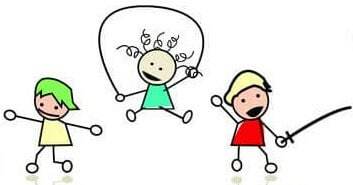 Squirt guns and super soakers are fun to use while running around the yard, but they’re generally not regarded as safe for the trampoline. 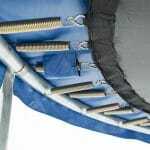 This is because they contain a lot of hard plastic components that could damage the trampoline or cause injuries to your children. These foam water blasters are much safer for trampoline use. Your children can enjoy water gun wars safely as they jump and bounce. If they tumble on the water blasters, there’s nothing to worry about – the soft foam won’t hurt anyone. Since soft balls are much safer on a trampoline, you may not want children to use a real football. Since the enclosure net limits how far they can run, some collisions with a hard ball may be unavoidable. By opting for a realistic foam ball, children can safely practice their football throws and minimize the risk of injury by collision. One of the best parts of choosing a foam ball is that it won’t rebound as high when it hits the jump pad, so it isn’t likely to fly over the enclosure net and disrupt gameplay.